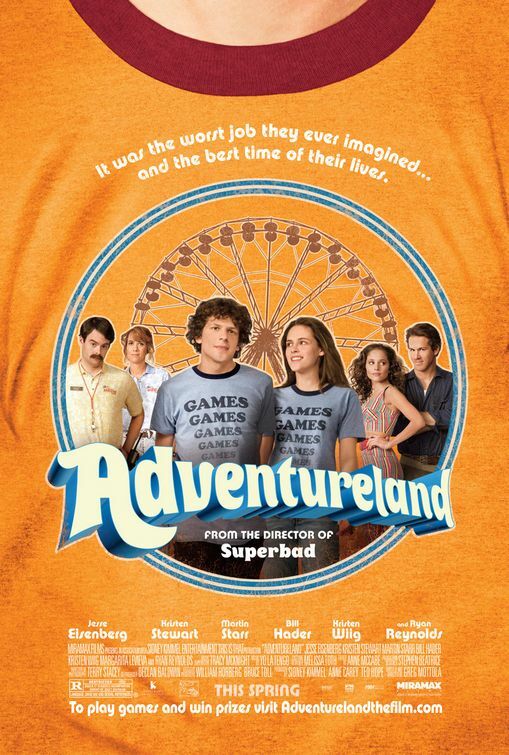 Adventureland is one of those movies that breaks one of the key rules found in books and classes on screenwriting. The hero is a passive character. James (played winningly, as usual, by Jesse Eisenberg) is someone whose active goal (a summer in Europe followed by enrollment in an Ivy League college) is nullified when his parents have an economic crisis. He then becomes like the hero Ulysses, except that while Ulysses is trying to get from geographical point A to geographical point B, James is trying to get from temporal Point A to temporal Point B (the beginning of summer to the beginning of fall). While he does this, he passes his time working at a somewhat pathetic and unamusing amusement park (made all the more pathetic because the owners and workers know exactly how pathetic it is) and reacts to everything going on around him while learning all sorts of life lessons usually found in movies like this such as Summer of ’42, Red Sky at Morning and the more recent The Mysteries of Pittsburg (coincidentally all are about centrals character losing their virginity, though in Mysteries… it’s about losing one’s virginity to man). Adventureland is a very good and enjoyable movie. It may fall a tad short due to a slightly uneven tone and the obviousness of the life lessons learned, but the characters are so rich and shrewdly drawn and the whole thing is just so damned entertaining, that one can do little but wax nostalgic for that same summer in one’s life when one learned all the life lessons that other guy claimed to have learned in kindergarten. The empathetic and intelligent screenplay is by the director Gregg Mottola. Sleep Dealer is a clever and exciting sci-fi movie that like most sci-fi movies and books is not about the future but is a metaphor for the present. In this case, it’s America’s treatment of illegal immigrants and the recent trend in outsourcing jobs, with water shortage thrown in. In Sleep Dealer, all those jobs that many people claim no one in America wants are still done by foreigners. But here the workers have nodes implanted in their bodies so they can hook up directly to computers and the internet and do their work (build buildings, drive taxis, nanny) via robots, while staying on their side of the Rio Grande. The factories where the workers hook up are just futurized sweatshops. The able actors are ably supported by the attention to detail paid as to how such a situation would work. In the end, as in many sci-fi movies like this (Bladerunner, 2001: A Space Odyssey) the human condition triumphs over the non-human or mechanical. The smart screenplay is by Alex Rivera (who also directed) and David Riker.